Full of practical information on assessing, diagnosing, and treating alcohol gambling addiction, this handy manual in the new Wiley Series on Treating Addictions is an invaluable tool for anyone who works with clients experiencing problems with gambling. William G. McCown, PhD, is a clinical psychologist with over twenty years of addiction experience. He combines appreciation of traditional approaches to treatment with a commitment to evidence-based methods. An international consultant, he pioneered one of the first Internet-based treatments for disordered gambling. 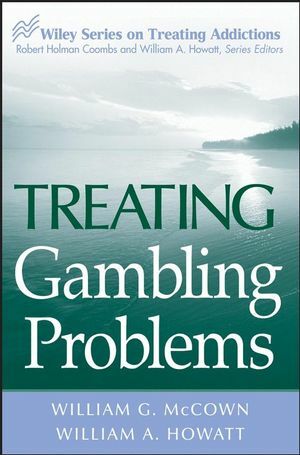 ?He is the author of several books, including Best Possible Odds: Contemporary Treatment Strategies for Gambling Disorders with Linda Chamberlain (published by Wiley). William A. Howatt, PhD, EdD, has more than eighteen years' experience as an addiction counselor. He is an internationally certified alcohol and drug addictions specialist, gambling addictions specialist, registered professional counselor, and registered social worker who has also completed post-doctoral work in addiction studies at UCLA School of Medicine. He is a faculty member of Nova Scotia Community College where he teaches in the addiction counselor program for the School of Health and Human Services. He is author of numerous books including The Addiction Counselor's Desk Reference and is coeditor of the Wiley Series on Treating Addictions (both published by Wiley). Chapter 1. Conceptual Foundations of Gambling Disorders. Chapter 2. Recognizing ambling Disorders: Signs and Symptoms. Chapter 3. Utilizing Optimal Professional Resources. Chapter 4. Developing an Effective treatment Plan. Chapter 5. Recovery Theories, Programs, and Tools. Chapter 6. Continuing Care: When and How Should Clients Be Discharged. Chapter 7. Posttreatment Recovery Management: Models and Protocols of Relapse Prevention. Chapter 8. New Beginnings: Moving Beyond the Addiction.